> Try this tricky business: Stand in a doorjamb with your arms out at your sides. 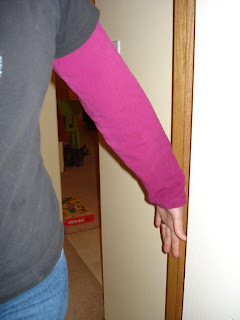 Push the tops of your hands against the doorjamb. Push as hard as you can for about thirty seconds. It has to be for a long time, otherwise it won’t work. Step out of the doorjamb and relax your arms. They should feel like they are going to lift up all by themselves! This activity promotes motor control and ability exploration.